From its very first issue, Marvel’s Ultimates² has reveled in being deeply committed to the sort of old-school super-science that defined comic books like The Fantastic Four. In its final issue, the team finally managed to save the multiverse and make some wild new friends along the way. The final story arc of Ultimates² has largely focused on the team, newly appointed as Galactus the Lifebringer’s heralds, investigating multiversal anomalies that have sprung up as a result of Eternity (the embodiment of all universes) being imprisoned by a mysterious, evil entity. In addition to deploying his heralds, Galactus has formed the Eternity Watch, a team of other cosmic being like himself—including Ego the Living Planet, the Infinaut, the Shaper’s Ghost, and the Psi-Hawk—to move through the multiverse in ways that only living abstract concepts can. In the last issue of the series, the Eternity Watch learns that Eternity is being collapsed into a single universe and consumed alive by something older than itself: the First Firmament. Eternity’s gradual destruction, Galactus explains, isn’t just causing the disappearance of different universes the way we’ve seen in previous arcs like Secret Wars, but is threatening beings like Death and Infinity whose existences are key to the very fabric of reality. The cause of the First Firmament suddenly attacking its progeny? The Maker, an evil, alternate-universe version of Reed Richards who is convinced that he can control the First Firmament to eat just enough to reduce all of Marvel’s multiverses down to one, and make that single universe into a paradise. In desperate need of his Heralds’ help, Galactus sends a request to the Ultimates, who are currently busy trying to deal with the impenetrable shield wrapped around the earth (see: Secret Empire). Anticipating Galactus’ move, the Maker summons a team of his own that hasn’t appeared in Marvel’s books for ages, also called the Ultimates. As in the Ultimate Avengers from Earth-1610. What happens next is best if you try not to think about it too hard and just appreciate it for the wild ride that it is. As the First Firmament slowly digs its teeth into Eternity, Galactus and the Makers’ teams square off against one another in the sort of battle that you normally only hear about in excited conversations between uber-fans debating which characters are the strongest. Both teams of Ultimates get into an all-out fistfight in which America Chavez, most recently familiar with her Captain America (who’s now the supreme leader of Hydra), punches the hell out of Ultimate Captain America, who reminds her that the A on his forehead doesn’t stand for France. Blue Marvel, living anti-matter generator, takes on the Ultimate Hulk, a cannibalistic red-pill version of Bruce Banner, who’s shocked to find that he isn’t nearly as strong as he once thought of himself as being. Ultimate Tony Stark quickly realizes that something’s amiss with the mission they’ve been sent on, and convinces the humans in the room to stop punching each other long enough to think about what’s happening. Ultimate Wasp and Ant-Man are the first to remember that they shouldn’t even exist anymore, and the Ultimate Avengers immediately come to the conclusion that the Maker is up to no good. Working together, the newly united Ultimates³ dispatch the Maker with—wait for it—the High Evolutionary’s help, and get to business literally pooling their collective geniuses to give Eternity the power to resist the First Firmament and restore the multiverse. It... makes absolutely no sense, but it’s cool as hell. As Eternity returns to its rightful place within the space outside of all that is, it realizes that it doesn’t truly have to be alone in its fight to resist the First Firmament. There are other living embodiments of previous multiverses who are ready and willing to fight the ultimate battle. Again, just drink in the insanity of that idea rather than trying to logic your way through it. Ultimates² closes with Galactus returning his heralds to their places outside of Earth’s shield, explaining to him that the events of Secret Empire were destined to happen and that his intervention would be an insult to fate. But, he explains, much like a reassuring father, it’s all going to work out just fine. 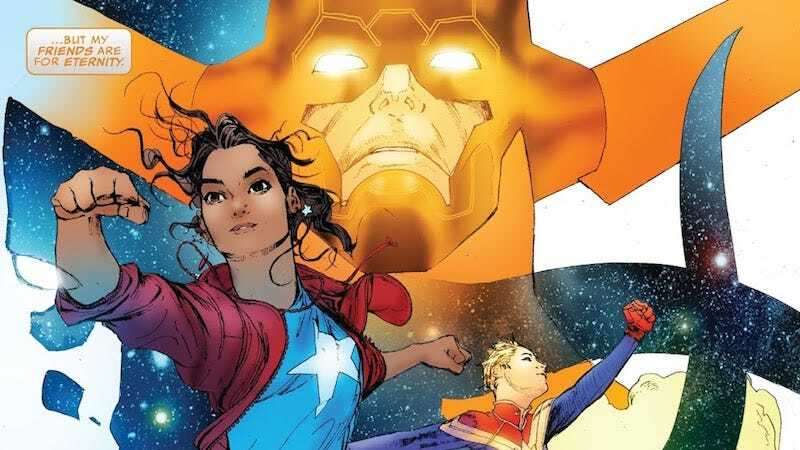 Galactus and the Eternity Watch go their separate ways with a new perspective on the roles that they are fated to play in the future of the multiverse—and as sad as it is to see Ultimates² ending, there’s something incredibly hopeful about the way it does. Its core message is that with enough gumption and hope, there’s always the possibility for a fresh start and a new opportunity to make things right in the grandest scheme of things. It’s an idea that we could all stand to believe in more often, and one that, hopefully, will resonate throughout the rest of Marvel’s books as well.